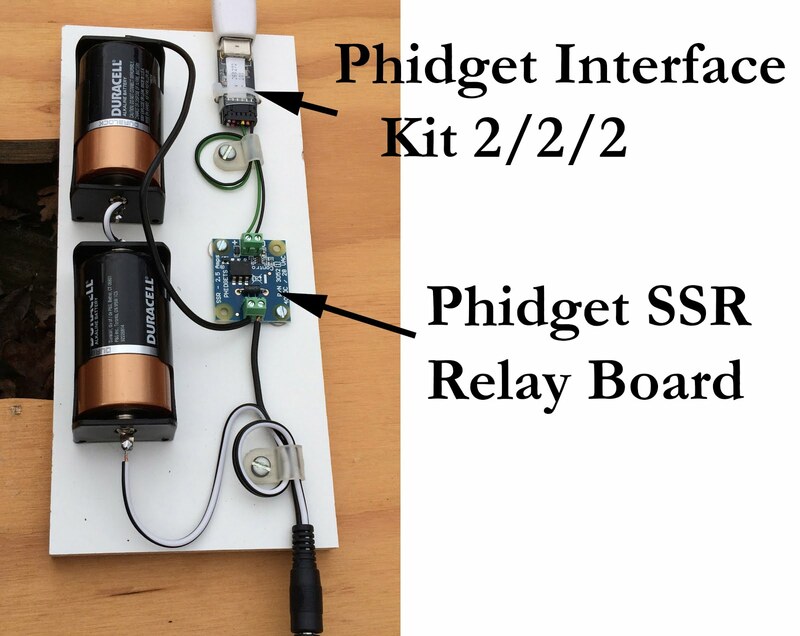 DIY Motion Control - "Loco Moco"
With some inexpensive hardware you can build a simple motion control system for your time-lapse work. 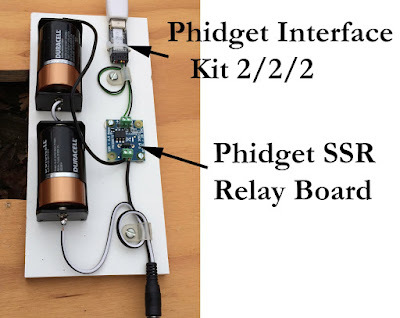 The interface between the computer and the locomotive uses two inexpensive Phidget devices. Enjoy a front-row seat to the restoration of the USS Constitution, the world’s oldest commissioned warship afloat and America’s Ship of State. 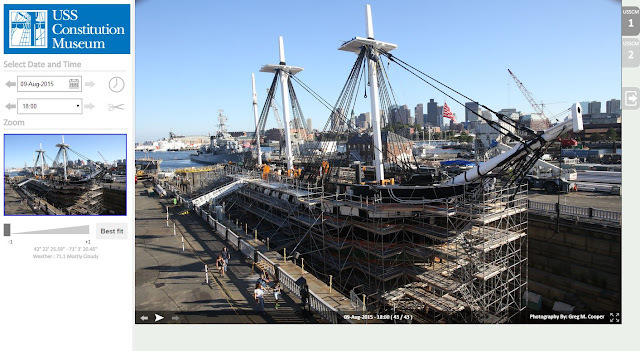 GBTimelapse user Greg Cooper was retained by the USS Constitution Museum to document the three-year restoration project. The Constitution Cam displays photographs from a unique vantage – outside a third floor window of the USS Constitution Museum. The image will automatically refresh every few minutes. The USS Constitution Museum retained me to document the three-year restoration of the USS Constitution which is taking place in Dry Dock 1 at the Charlestown Navy Yard. I chose to document this historic event using time-lapse photography in order to generate a time-lapse movie of the event. 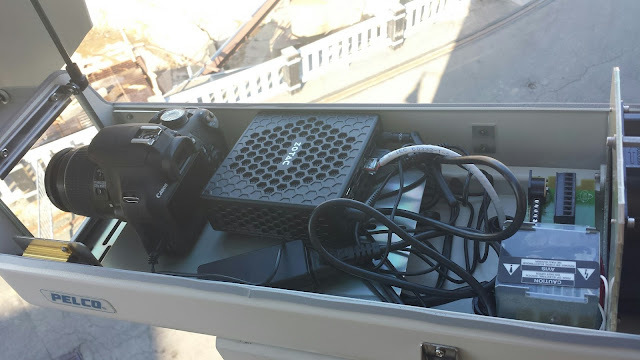 The equipment includes a Canon DSLR camera and a mini computer running Windows operating system with an internet connection in an all-weather housing. The higher end Cannon DSLR cameras do not have a built-in intervalometer to capture images at a predetermined time and requires an external shutter release with a built-in intervalometer. Basic intervalometer devices can control the interval at which images are captured, for example, once every five minutes. However, they cannot control the times of day when images are captured, for example, only between 6am and 10 pm. There is little to no activity at the dry dock during the evening hours. Images captured during this time would be unnecessary and require extra data transfer, storage and management. I needed a tool that could control both the interval and the time of day that pictures are captured. I found Granite Bay Software to be the best solution. I run Granite Bay software on the mini computer to remotely control not only the interval and timer period of image capture but also to modify the script that controls other camera settings. With Granite Bay Software, I can also transfer images using its built-in ftp protocol to an offsite server. That server has custom viewing software that I developed and which allows the visitor to view images from specific dates and times. In addition, the website dynamically builds a video clip of the restoration progress each night for client viewing. The museum continually showcases the most recent image on their blog during the restoration process and provides a direct link to the viewing software website. The capabilities of Granite Bay Software enables me to provide these services to my client. The 2015 restoration marks the first time that USS Constitution has been dry docked in the 21st century. Dry Dock 1, in the Charlestown Navy Yard, is the second oldest operational dry dock in the United States and Constitution was the first warship to enter that dock on June 24, 1833. The work of this restoration will include replacing the lower hull planking and caulking; removing the 1995 copper sheathing and replacing it with 3,400 sheets of new copper that will protect the ship’s hull below the waterline; replacement of select deck beams; and on-going preservation and repair of the ship’s rigging, upper masts, and yards. The cost of the restoration is expected to be $12-15 million and will be paid for by the U.S. Navy. GBDeflicker4 is now available! AND...it is compatible with Adobe CC 2015 and 2017! GBDeflicker4 is a major release version from Granite Bay Software with increased speed and support for 32-bit color! As many of you know, the GBD3 (GBDeflicker3) plugin is designed for Adobe CS6, CC and CC 2014. GBD3 was designed correctly for CC and CC 2014, but the new Adobe CC 2015 is so different internally, they aren't compatible. Good news...we have a solution! 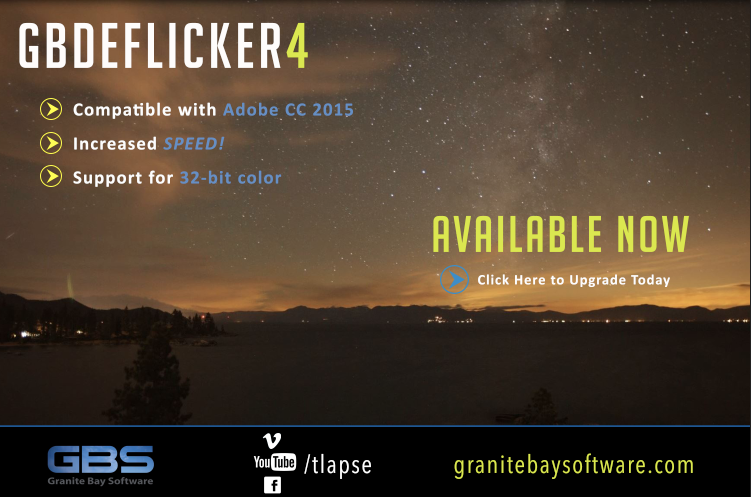 We have released GBDeflicker4, a totally compatible plugin for Adobe CC 2015. Upgrade! - If you purchased GBD3 or a prior version on or after January 1, 2016, you are eligible for a free upgrade to GBD4. If you purchased GBD3 or a prior version before January 1, 2015, you are eligible for discounted upgrade price. Continue to Use Your Current GBDeflicker - GBD3 will still work with Adobe CS6, CC and CC 2014 and GBD2 will still work with CS5, CS5.5 and CS6 (64-bit). After Effects for CC 2015 has been redesigned with the Adobe release of CC 2015, so releases of GBD3 prior to April, 2015 will crash when run on CC 2015. GBD3 will warn the user, but it will crash if the user attempts to run GBD3 on CC 2015.